Quite simply one of the most famous badges, and possibly the most famous sports car of all time, the Porsche 911 has been with us in one form or another for decades now, and in that time it’s developed a reputation for delivering a pure enthusiast’s driving experience. Although the 911 has become more modern and luxurious as time has gone on, Porsche has remained stubborn that the engine should stay at the back, endowing the car with a unique character and spectacular handling. This is the latest 992-generation model, and it doesn’t change the formula so much as refine it. The new design pairs classic Porsche cues and carryovers from the previous model with a few additional touches. Don’t be fooled, though – the bodyshell is entirely new. All cars now receive the same wider stance previously reserved for all-wheel-drive models, so the only true distinguishing features between the two launch models – Carrera S and Carrera 4S – are the badges and a piece of trim above the tail lights. The rear uses the same style of full-width light bar as the Cayenne. 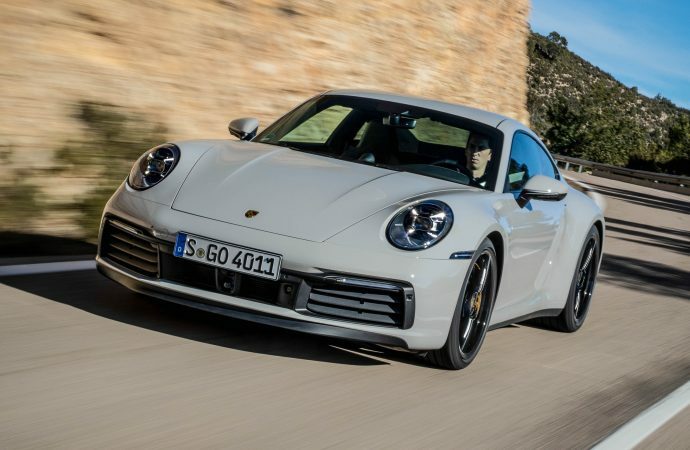 Under the skin, there’s more power from the flat-six turbocharged engine, along with a few chassis alterations (including, for the first time, differently sized wheels front and rear) and a new, eight-speed PDK dual-clutch gearbox. 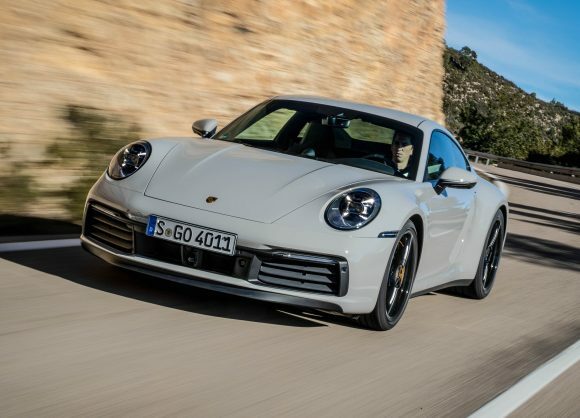 The only choice customers will have to make at launch is whether they’d like two- or four-wheel drive – as there are only the Carrera S and Carrera 4S to choose from for now. Both use the same rear-mounted flat-six engine, producing 444bhp and 530Nm of torque. A seven-speed manual gearbox is on the way but an eight-speed dual-clutch automatic is all that’s available at the moment. As for performance, it’s as impressive as the numbers suggest. The Porsche 911 is one of the most capable, rewarding and downright satisfying steers on the market. So good are the driver aids that the 911 never appears to be anything but unflappable, yet the whole experience is wonderfully analogue in feel. It may be a cliché but the driver really does feel in harmony with the machine. The new 911 is, well, unmistakeably a 911. The bum-heavy silhouette and sloping nose is a product of the rear-engine layout, and it’s definitely iconic. For the 992, Porsche has sharpened up some of the edges and given it even more purpose. Round the front, things are much the same as before, but the lid to the ‘frunk’ (or front boot) now has corners rather than a rounded edge. The rear, meanwhile, has been totally redesigned. The interior’s been given a serious injection of class, but the clear driver focus remains. The driving position is nearly perfect and endlessly adjustable, with comfortable seats that hug your body just enough without being too tight. The central screen is large, super-responsive and crystal clear. Don’t expect to pay the 911 Carrera S’s sticker price of £93,110. To get the best out of this car, it really needs some options added. The test cars we drove would have cost no less than £115,000. We’d say Porsche’s Dynamic Chassis Control is a must – it costs £2,273 but must be paired with £1,592 rear-wheel steering. The Sport Chrono Pack is also essential, bringing the drive mode selector and a stopwatch for £1,646. ThisisMoney.co.uk said: ‘The cabin has been uncluttered like a housemaid has been at it on a spring-time mission.’ Sunday Times Driving said the 911 is ‘still the benchmark that all other sports cars want to beat’. Getting the 911 ‘right’ is something Porsche has managed time and time again, and we’re thrilled to say it’s pulled it off once more. From a driving perspective, this is an incredible car.